Finding the Pennies: "Beans and Rice, Rice and Beans"
While looking for another recipe the other evening, I was reminded of a recipe for black bean soup that I haven't made in a while... probably a couple of years... and boy, did it sound good! Not only simple to make, delicious and nutritious, but it's inexpensive, too! I was a little nervous about what my daughters would think of it, but recently, I never know what they will like and not like, so I didn't feel I had much to lose. I better quickly explain the title of this post. Dave Ramsey, the American financial "advisor" radio host who I'm an avid listener of and whose advice I mostly follow, says all the time when he advises people how to get out of debt, "Beans and Rice, Rice and Beans", meaning to cut waaayy back on expenses in your life. We quite literally followed his advice! 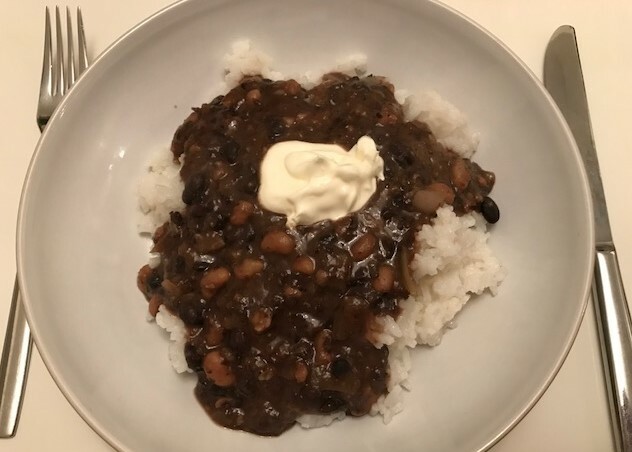 I keep my eyes peeled for black beans when I'm out and about, but the only place I can find them are at Sainsbury's for 65p a carton (below). 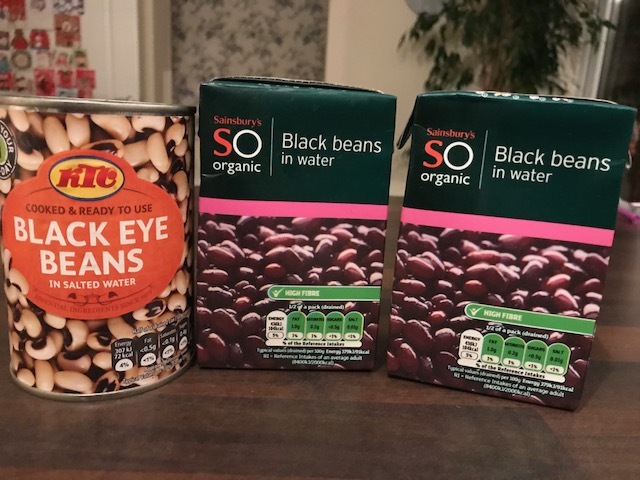 Not terribly expensive, but I bought the tin of black eye beans for 30p, so less than half the price. I hoping to find dried black beans, but even spending £1.30 for two cartons of beans isn't too bad. This is the original recipe from Comfy in the Kitchen; however, quantities aren't listed, so I'll give you an idea of what I used - it's a pretty straightforward soup recipe. Heat the oil in a medium/large saucepan/pot, then add the onion. After the onion cooks a few minutes, add the garlic and stir being careful not to allow the garlic to burn. Add the chili powder and cumin, stir and cook for about an minute. Add the beans, crumble the stock cubes in and add the water. I used about of cup of homemade chicken stock along with the stock cubes and water. I let this boil about 10 minutes, then turned off the heat used a immersion blender (handheld stick blender) to puree the soup a bit. I wanted my bean soup to be a bit chunky, so I only blitzed it a little bit. I ended up boiling it another 5 minutes to allow more water to evaporate so it was a bit thicker. That's it. I boiled plain 'ol rice while I was making the soup and served this with the bean soup, topped by a dollop of plain Greek yogurt and a sprinkle of cheddar cheese. To my amazement and delight my girls gave this dish two thumbs up! Not only did this £2 meal - for the whole pot - feed us all this evening, there are at least 3 meals leftover in the fridge. I hope you'll try this soon. Please let me know if you find black beans cheaper anywhere else and if you try the soup in your home!